....The bag looks fantastic by the way!!!! Kerstin, thank you for your help it has been a pleasure dealing with you (although rather expensive!!!!!) I will most certainly be placing orders with you in the future and also recommending you to others. My bag arrived this morning - I can only say it is fantastic!!!!! 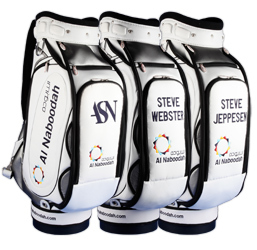 Thank you for the bags, Mr. Al Naboodah is extremely happy with them and so are the players. 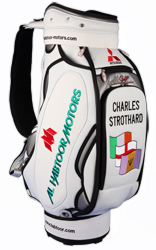 I would like to order another bag and covers for European tour player PETER LAWRIE please?